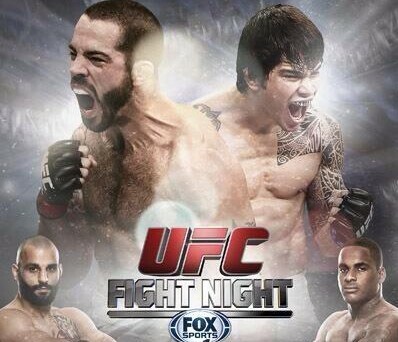 On Saturday Erick Silva will be fighting Matt Brown in an explosive Welterweight match at UFC Fight Night 40 in Cincinnati! Also on the card, Costas Philippou will be taking on Lorenz Larkin and Erik Koch will be matched up against Daron Cruickshank. Smolka won his UFC debut against Alptekin Ozkilic via unanimous decision; while Cariaso defeated Danny Martinez via unanimous decision. Cariaso has a tendency to win by decision, and I think that’s how he wins this one. He will exploit Smolka’s weak takedown defense and grind this one out. Palelei is coming off of a knockout over Pat Barry and Potts is making his UFC debut. I think Palelei will overwhelm the rookie in the first. Potts needs to use his grappling to wear Palelei down, but I just don’t see that happening. Tim Means will make is return to the octagon after a short stint in the LFC. Magny is coming off of a unanimous decision win against Gasan Umalatov. Magny should look to get this fight to the mat. Standing with Means, who is the better striker, would be a bad idea. I think Magny can drag Means to the mat just enough to edge this one out. Koch was successful in his 155 pund debuting, when he defeated Rafaello Oliveira via TKO in the first round. Cruickshank is coming off of a TKO win against Mike Rio but has failed to find consistency in his UFC career. Cruickshank is a very flashy figher, he uses unorthodox kicks a lot in the octagon. Koch also prefers to strike, but he is not as flashy as Cruickshank. I expect this to be a stand up war, but Cruickshank’s inability to string together wins will strike again. Philippou had his liver obliterated in his last fight with Luke Rockhold. Larkin also failed to pick up a win, losing a unanimous decision to Brad Tavares. 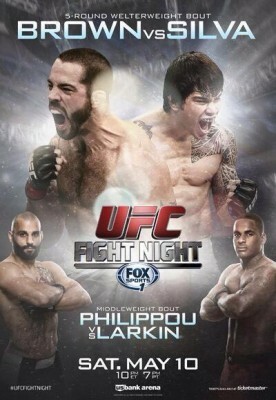 Philippou has excellent boxing while Larkin tends to mix it up more. Both are very weak against wrestlers, so I guess it’s a good thing neither of them are wrestlers! Philippou’s crisp boxing should allow him to take this one. Matt Brown has been on fire lately, winning six straight fights. Erick Silva is coming off an impressive TKO over Takenori Sato. Brown has improved leaps and bounds lately, especially in his grappling. Silva is another fighter who can’t seem to find consistency. Silva loves to swarm and overwhelm his opponents, but can’t handle it when he is being swarmed. Matt Brown is a brawler, but a very technical one. He might not be the fastest or have the best technique, but he overwhelms you and keeps the pressure on. I think he does this to Silva tomorrow night.